According to Steve Maltz, author of God’s Signature, the only time the sacred, personal Name of God was spoken by the ancient Israelites was during worship in the Temple in Jerusalem, and especially on the Day of Atonement when the High Priest pronounced it ten times. The Talmud has many warnings about using the most holy Name – it is also regarded as having special powers of healing. Apparently knowledge of its pronunciation was lost after the fall of the Temple in AD70 prophesied by Jesus Christ. The knock-on effect of that event, together with the Roman Church’s withdrawal in the third Century of financial support for churches in the Holy Land founded by Jesus’ own ‘kith and kin’ (‘desponyni’), was the great loss of a full understanding of the Church’s Hebraic roots. Hence the confusion and doctrinal disagreements over Jesus’ claim, “I am in the Father and the Father is in me” (John 14:10). Digging deeper we encounter an astonishing revelation of that double-identity! From translations of Hebrew, the post-Shakespeare English-speaking world referred to God’s Name as ‘Jehovah’ or ‘LORD’ (letter ‘J’ was then starting to replace ‘i’). However, Jews preferred well-known descriptive titles such as ‘Elohim’ – God, in all the fullness of His attributes; ‘El Shaddai’ – Almighty; ‘El Sabaoth’ – Lord of heavenly hosts; or Adonai’ – Lord, and more often than not the reverent term ‘Ha Shem’ (The Name) sufficed. “Yod-Hey-Vav-Hay” first appears in Genesis 2:4 statement that ‘The Book of Beginnings’ is the account of, “When the LORD God made the earth and the heavens”. This Name was first revealed when Moses encountered God in the burning bush after he’d asked Him whom should he tell the Israelites had sent him to get them out of their slavery in Egypt. Steve writes, “Interestingly and contrary to popular belief, the Hebrew word used in this passage…is not YHVY (he shows Hebrew characters). So, what’s going on here? Is it His name or isn’t it? In this Exodus passage, the word used for His name is “Aleph-Hey-Yod-Hey”. 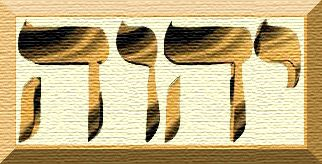 “This takes the meaning of “I will be”…(which) shares a similar three-consonant root with YHVY in Hey-Vav-Hey and Hey-Yod-Hey…and as they’re related are both ways of describing God”. Hence my liking of describing God as “Always” and “Now”, the latter being used by Charlie Shamp too. As in those preceding links, literary Hebrew developed out of pictographic forms that represent gestures and their meanings. We logically surmise both original visual and later written forms were known to and, therefore, used by the Lord in communicating with Abraham and his descendants through Issac and Jacob, and used by Moses and his scribes in compiling the first five books of the Bible. Hebrew is read right to left, ie ‘hand-look-nail-look’, but if we read as normal left to right we find not only the Name of God describing who He is, the fullness of His character and abilities, but also its exceptional prophetic nature in it foretelling the pivotal point of His action plan for humanity: the crucifixion of His Son Jesus Christ! AND THIS ‘WORD’ SHOWS TWO PERSONS! Steve Maltz: A Deep Insight From Hebrew – Holy Treasure of ‘The Open Door’. Dr Arnold Genekowitsch Fruchtenbaum is founder and director of Ariel Ministries, an organization which prioritizes evangelization of Jews in the effort to bring them to the view that Jesus is the Jewish Messiah. He lectures and travels widely. This event is one of several recent ‘God-incidents’ regarding this famous Old Testament book of prophecies. Maybe I’ll see you there? Global exposure and condemnation at long last of this nasty, pretentious Holocaust denier’s vile personality. Next, Britain’s Labour Party and its leader…? Modern Israel Turns 70 — here are 70 fascinating facts about the modern Jewish State you might not know! (Jerusalem, Israel) — It’s been an exciting and joyful week here as Israelis celebrate the 70th anniversary of the Jewish State’s modern existence. Fireworks. Dancing. Picnics. Air shows. And so much more! I must say it’s been deeply humbling to move here with my wife and sons, to become Israeli citizens, to build friendships with Arabs and Jews and so many others, and in recent months to actually move to Jerusalem and live here in the capital city that King David established some 3,000 years ago. Sometimes, it simply seems surreal. It’s certainly a great place to raise a family — and write novels! Not long after Father God brought Jesus the Messiah back from the dead by His Spirit, the One who’s the radiance of His glory went once again in search of His ex-fisherman friends. Of the two sets of brothers who’d been partners in the fishing trade on the Sea of Galilee before deserting their nets to follow a peripatetic teacher, their boss had an exceptionally severe crisis of self-confidence. So this ‘son of Jonah’, named Simon, decided to return to the simple life of sitting in a boat with buddies and dragging a net in the hope of getting a catch – but it proved to be an exercise in futility! A few years earlier on that inland sea, the four fishing partners encountered and had been ‘called’ by The One to follow Him. Jesus amazed the crowds there with His teaching and had asked Simon if He could address them from his moored boat. Jesus knew the men had worked hard all night without having caught anything because, when He’d finished speaking, He told Simon to sail into deep water and lower his nets despite the fruitless night – Simon was overwhelmed by the result! They’d got such a large number of fish that another boat was called for – then both began to sink with their massive weight!! So Simon changed his tune. Upon hearing Jesus’ instruction he’d objected because of the poor night, yet respectfully referred to Him as “Master” – but in amazement at the fresh catch breaking nets and sinking boats, Simon addressed Him with the superior term of “Lord”; thus suggesting he was beginning to understand the status of this astonishing teacher. In the account by one of those partners, John, they’d previously met Jesus immediately after His baptism in the river Jordan and Andrew had brought his brother Simon to see Jesus, who then spoke of his identity and implicit destiny, “You are Simon son of Jonah. You shall be called Cephas,” (which is translated ‘A Stone’, Petros/Peter: John 1:42). After that huge catch of unspecified quantity, Jesus called Simon into his destiny: “Do not be afraid. From now on you will catch men!” That is, a fisher of men. When they’d landed their boats the four foresook all and followed Him (Luke 5:10-11). This event would be replayed later but at a higher level when, once again, Simon will be caught by surprise! But before that, the four fishermen disciples were to become part of the twelve chosen as ‘Apostles’, who were given power and authority (Matt 10:2). And Simon was to have a personal revelation of Jesus’ real identity. He blurted out “You are the Christ, the Son of the Living God,” to which Jesus responded, “Blessed are you Simon Bar-Jonah, for flesh and blood has not revealed this to you but My Father who is in heaven. I also say to you that you are Peter, and on this rock I will build My church and the gates of Hades shall not prevail against it.” Also, he was further blessed to see Jesus’ transfiguration and hear Father speak about His beloved Son and instruct Peter, James and John to heed Him (Matt 16 and Matt 17). Yet this same Peter later earned a severe rebuke from Jesus because, in his devotion, he was shocked upon hearing Jesus speak of His destined execution and in dismay he spoke against God’s plans! AND then, when that dreadful event transpired, poor Peter was distraught during Jesus’ trial to hear himself thrice deny his association with Him! Even so, he was again blessed when Jesus visited, instructed and commissioned the Twelve (minus Judas the betrayer) after His miraculous resurrection from the dead. However, Peter must have considered his thrice-denial would cost him dearly in losing his standing with his Lord. Hence, a critical crisis of self-confidence for Peter. So, why not go back to fishing – and far away from Jerusalem? His ex-fisherman friend John records Simon Peter as having told him and five others – seven in total – he was going fishing – and they replied, “We’re going with you!” (John 21:2-3). In fact, Peter was heading into his own resurrection: that of his own self-worth, identity and calling! Believing readers will be very familiar with the wonderful reinstatement of Peter. When John recognised who the man on the beach was he told Peter and, being determined to be back with Him, Peter donned his outer garment and dived fully clothed into the water and swam about 100 meters to shore. This dear man, so like all of us as imperfect disciples, is asked thrice if he loves the Lord much more than his fellow disciples – that is, with ‘agape’ love: the unconditional, unconquerable, benevolent goodwill, as given by the Father and Jesus. Peter, rescinds and over-rights his previous thrice-denial to profess a less emphatic love (‘phileo’) that he knows he can give. In repeating His question at that lower level Jesus accepts but tests his profession further, thus giving him a threefold commission to be His under-shepherd. Read more deeply, if you’ve not already done so, about the significance of the specific size of this ‘resurrection’ catch in Joanne Rolston’s 153, Signs and Symbols. In part 2 we will go deeper into them as we look into the mysteries of the kingdom of heaven… continue reading. On Steve Maltz: A Deep Insight From Hebrew – Holy Treasure of ‘The Open Door’.